First off, thank you very much for considering commissioning me! :) Please read my Terms of Service and the info below before requesting or accepting my services, as this will improve your chances of getting your idea drawn. When the in-stream raffle is open, the spinny fox gif on-stream will display for rafflers to clearly state their desire for a slot. If you understand the TOS and procedure on this page, you may join the raffle by saying "I'd like a slot, nightvoop." in chat. Just like that. This is mandatory to ensure that you're serious. If you don't do it, no slot. You're encouraged to have your commission idea and details already made before the raffle. **You are not elligible for a slot if you have had a commission in the last 2 streams. Upon winning, you have a max 30 minutes to complete the form and the PayPal deposit invoice sent to you. If it is not, then you may be forfeit unless you give a good reason within that time. If you have specific directions, reference material, or poses, please include them in the form so that they can be worked out. The remainder of the pay, minus deposit, is to be invoiced and paid upon completion when time is factored in. While it is not mandatory, I strongly encourage my commissioners to visit in the stream as best they can so that I can have them available for questions and clarifications during the work process. Raffle-Roller Option: The FIRST person who says "I want the slot, and I will pay extra, BELIEVE IT!" auto-wins the raffle slot and commits to paying 50% more than the commission would have cost if they had won the raffle. These people are STILL NOT ELLIGIBLE if they had a slot in the past 2 available streams. First-Timer Free Raffle Token: For people who have not gotten a stream commission from me before, only! If you don't win a raffle or two, don't despair; I allow new customers up to THREE (3) losses until I bestow a free raffle-win token they can redeem on a later stream. Simply say 'I'd like to redeem my raffle token, Niko', or something to that effect, and it'll be as if you won the raffle that day. One per client, and only first-time clients. You must be 18 years of age or older to commission any adult-themed work. By entering my raffles or applying for a commission, you specify you are ready to provide ready info and payments right now. No space-holding. Payment plans can be made available for any commissions above $200. If you are uncertain as to what I typically draw, my gallery can be found in its most complete form currently at FurAffinity here, as well as on Weasyl, over here. Anything else is subject to Artist's Discretion. Please ask ahead of time if the idea you have in mind is something I would draw. As for my characters: While I do not object to art with them, I have standards unique to them, and have the final say in including them in someone's commission idea. Please ask first if you would like to involve my characters. Payment will be sent via two PayPal invoices (Deposit and Final) before and after the work has been completed. After fulfilling the Final invoice, your art will be sent to you via private Tigerdile chat in-stream (most direct), FA-note, or email. If the Client desires to cancel their commission before 1 hour of work has passed, 50% of the Draft will be promptly refunded. If the Client desires to cancel their commission beyond 1 hour, the Draft Invoice will not be refunded. Any funds voluntarily sent without invoice at any stage are regarded as a donation, and wholly welcomed in deep appreciation. I do work for my customers on a rate of $15 USD an hour, rounding by quarters of an hour. Time will be visible throughout the project and paused during times of breaks. The total cost of a project subtracts the deposit paid at the beginning, so when the picture completes, what I will quote to you is the total minus the deposit you already paid to begin. All commissions factor PayPal tax. Listed below are deposit prices only. Private Commissioning (request of no posting to the internet): +$20.USD, complexity depending. 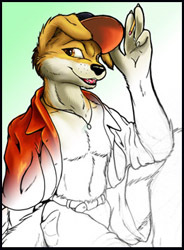 Site & its content is copyright 1997 - 2018 Dingo / NikkyVix and DrJones. Comments and feedback of any kind are welcome here!.